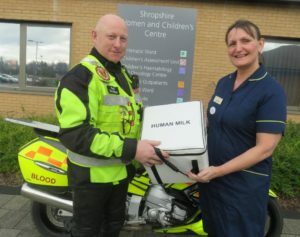 The neonatal team at SaTH has joined forces with The Shropshire, Staffordshire and Cheshire Blood Bikes to give mums the chance to feed their baby with their own milk, even though they are apart. Occasionally pre-term babies in the Neonatal Unit in the Shropshire Women and Children’s Centre in the Princess Royal Hospital (PRH) in Telford may be in a different hospital from their mothers, which means that they are unable to breastfeed them. However, the new partnership with the Blood Bikes means that a mother will be able to express her breast milk, which is then collected and transported by the bikers to the neonatal team to then feed the baby. Gina Powell, Neonatal Sister at SaTH, said: “We look after babies that have come from hospitals in Stoke or Wolverhampton for example, and those mums may have had a Caesarean Section and or may not be able to visit in the first instance because they are poorly.